This comes down to 14.38 cent per brick. 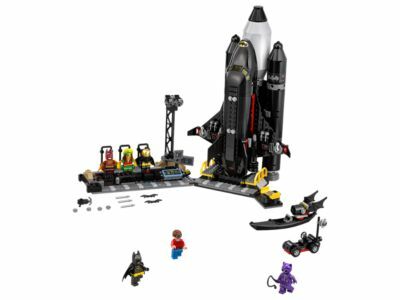 The The Bat-Space Shuttle (70923) Lego set is available from the sites below. However, they do not offer delivery to your selected region. The The Bat-Space Shuttle (70923) Lego set is no longer directly available from the sites below. However, 3rd party partners of these sites might still have the set available. Alternate description Launch a space mission from the Batcave! The Batcave has a dock for the Bat Space Shuttle, Bat-Kayak with a rotating display stand, sliding costume rail with detachable Reggae Man Batsuit, Space Batsuit and Firestarter Batsuit minifigures, computer keyboard and screen elements, weapon rack with 2 Batarangs, 3 arrows and a grapple hook for the grappling gun, plus rotating ‘reflectors'. Weapons include Batman's grappling gun and Catwoman's whip.